It’s Flóra back on the Altenew scrapbook blog with a new scrapbook layout made with many gorgeous Altenew products. I just got the new wide washi tapes and, of course, I had to try them. I used the Dotted, Floral Flurries and Monochrome Washi Tapes. First, I adhered them on a white cardstock and then, with a precision scissor, I fussy cut the gorgeous blue and pinkish flowers. It took some time but it’s definitely worth the effort. I placed the Dotted Washi Tape strip in the middle of a 12×12 white cardstock and layered all the fussy cut flowers around it. I used foam tape to create dimensions. Between the flowers, I added some butterflies from the Reflection Collection Epoxy Buttons and Wood Veneers. On the right side, I framed my photo with Reflection Collection White Decorative Frames. 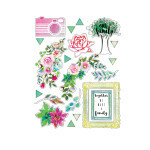 To balance my page, I added a camera sticker from the Our Family Cardstock Stickers Sheet with a title created from the Reflection Collection Alphabet Puffy Stickers Sheet. I stamped few sentiments from the Floral Shadow Stamp Set with Jet Black Ink. In the end, I scattered blue, dark pink and black Enamel Dots from Our Family Scrapbook Collection and New Day Card Kit. I hope you will try out these beautiful, new Altenew Washi Tapes. This is so pretty! I’m definitely inspired!! Thank you very much Dara! Thanks Karthikha! I agree, these washi tapes are really beautiful!